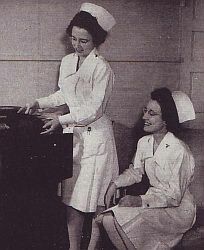 Prior the outbreak of war, the nurses were issued a hospital uniform which consisted of a white, one-piece dress, a white cap, white shoes and stockings and a blue wool cape. .v In 1940, the length of the hospital dress was reduced by 6 inches and a blue cotton crepe dress of the same design as the white poplin uniform was added. Colored crepe was deemed more practical for places with limited laundry facilities as it was expected to be the case in war times. Later blue seersucker replaced the blue cotton crepe. The hospital dress could be worn with long sleeves or short sleeves. In the end of 1941, a new design for the completely outmoded hospital uniform was submitted. The new dress was a form-fitting garment, buttoned above the waist with three mother-of-pearl buttons. The skirt held closed in front by seven concealed snap fasteners. The dress had a yoke back and two patch pockets. Note the epaulets of same fabric which are sewn on completely. . The hospital uniform was issued in the colors white and powder blue. It was provided with long sleeves and short sleeves. The white uniforms were made of poplin and the blues of seersucker. The white uniforms were to be worn in the continental United States only. Uniform, Cotton Seersucker, Nurse's ... In September 1942, a 4-ounce, brown and white-striped seersucker fabric was selected for the hospital uniform to be worn in overseas areas. The new hospital dress consisted of a simple, short-sleeved, wrap-around uniform with a tie belt. The wrap-around style should allow ease in fitting and adjustment to the individual figure. The elemination of all buttons further increased its practicality. Inside, a tie string at the waistline was added to prevent that the skirt blow open or slide apart. On duty, the seersucker uniform was worn with a matching hospital cap. A matching semi-fitted, collarless, one-button cardigan style jacket could be worn over the dress provided the nurses with a serviceable street outfit for warm weather. 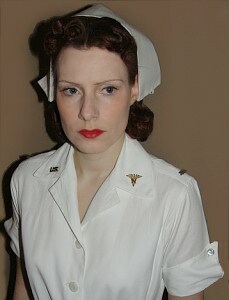 In the summer of 1944, the use of the seersucker uniform was extended to Army nurses serving within the United States discarding the white uniform. In the summer of 1943, the urgent need to develop a hospital uniform with trousers was noticed. For example, such a uniform was necessary for nurses who were assigned to hospital ships and trains where they had to climb ladders to attend patients in upper bunks. Additionally, many nurses in overseas areas served in hospitals where litters instead of beds were used. A combination of shirt and slacks made of the 4-ounce brown and white-striped seersucker was developed for wear in warm climates. In early August 1943, the design of the shirt and slacks was approved. At the end of the month both items were standarized. .. Field Work Uniform . At the begin of the war, the Army had no suitable uniforms for nurses who had to work under field conditions. Therefore, these women were initially issued with men's coveralls and men's slacks and shirts. The first field fatigue uniform designed for female Army personnel was a one-piece coverall made of olive-drab herringbone twill. The coverall was soon replaced by a two-piece model made of herringbone twill only, consisting of shirt and trousers. The shirt could be worn with collar open or closed. It had two breast pockets with flaps to button. The trousers had adjustable button closure on each side of the waistband. Field shoes with or without leggings could be worn with this work suit. Headgear was the olive-drab wool knit cap or the fatigue "daisy mae" hat. 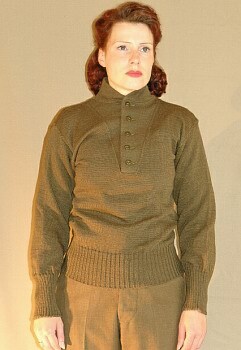 Both, the herringbone twill coverall and the two-piece variant were criticized as ill-fitting and unbecoming clothing. On the one hand, the herringbone twill cloth was too hot for summer wear. On the other hand, it was too thin to protect against cold winter weather. Furthermore, it was too clumsy and too unsanitary for hospital work. The herringbone uniform was issued in three (later four) sizes only (Small, Medium, Large, X-Large). This caused many problems with bad fitting. It even increased the risk of accidents. Another problem was that the herringbone twill fatigue garments were difficult to launder because of the weight of the material and often did not dry over night. In addition, they tended to shrink and faded out. ..
Summer Work Uniform ... At the end of 1943, the need of khaki slacks for female Army personnel serving in jungle environment and in warm climates became more and more urgent. The seersucker slacks couldn't provide sufficient mosquito protection and the HBT clothing also had proved insufficient. Therefore, a summer work uniform consisting of a khaki twill shirt and slacks was developed and finally approved in the end of 1944. The slacks suit was similar in design and material to the one issued to Army men. The summer work uniform should replace the herringbone twill work clothing and the seersucker uniform in tropical areas.
. Non Regluation Outfits . In the following, a few examples of non regulation outfits which were worn by Army Nurses when no proper female work uniforms were at hand.
. [ I. Development ] [ II. Facts about the ANC ] [ III. Uniforms ] [ IV. Sources ]..